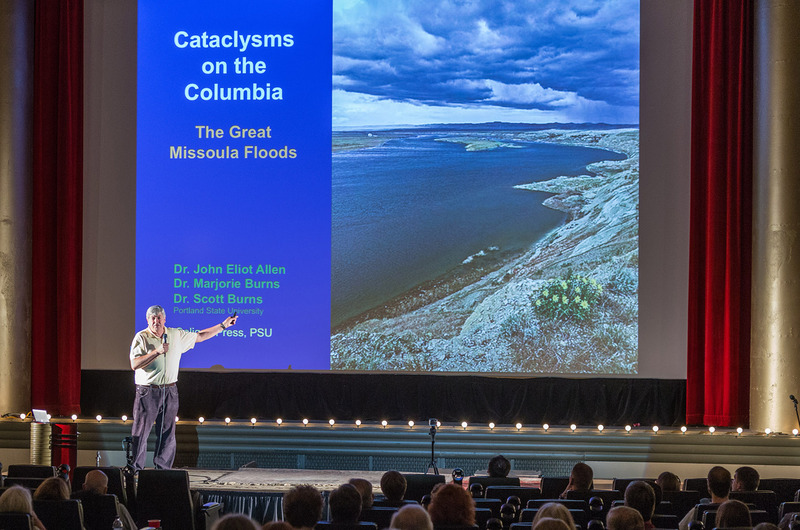 This episode features the talk Cataclysms on the Columbia: The Great Missoula Floods, by Dr. Scott Burns from Portland State University. The Missoula Floods were a series of 80+ floods that happened in the Pacific Northwest during the last ice age around 15,000 years ago, and they dramatically shaped the geology and topography of Washington and Oregon. Scott describes with enthusiastic detail what caused the floods, who discovered them, what evidence was used to prove that they happened, and some of the people continuing to study them today. He also touches on Lewis & Clark, the Willamette Meteorite, scientific grudge matches, what to ask geologists on a road trip, and how to grow good wine grapes, among many other things. Scott’s slides have been synched with this recording and uploaded as an m4a format as an enhanced podcast, so depending on your media player, you may be able to see the pictures of what he’s describing as the audio plays along. This talk was recorded at event held at the Kiggins Theatre in Vancouver, Washington, and hosted by Via Productions.